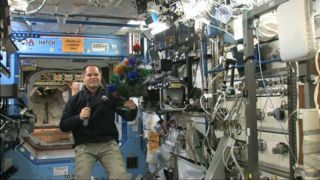 Christmas in space: NASA astronaut Kevin Ford, commander of the Expedition 34 crew on the International Space Station, wishes the world a Merry Christmas from orbit with a cosmic Christmas tree. Christmas in orbit might not look exactly like the holidays on Earth, but the astronauts living on the International Space Station this holiday season try to make the orbiting science laboratory as homey as possible. The six members of the station's Expedition 34 crew, three of whom just arrived last week, will all be spending Christmas and New Years Day aboard the spacecraft, but that doesn't mean they don't get to celebrate. Hundreds of miles above the Earth's surface, the spaceflyers will eat, exchange gifts, and be merry during Christmas and when welcoming in the New Year. The space station crew will be off duty for both Christmas Eve and Christmas. That means that they won't need to work on any of the 110 experiments aboard the station, and they can take as much time for meals as they want, NASA spokeswoman Nicole Cloutier-Lamasters told SPACE.com. The week before Christmas was an eventful one for the orbital crew as well. Canadian Space Agency astronaut Chris Hadfield, NASA astronaut Tom Marshburn, and Russian cosmonaut Roman Romanenko arrived on Friday (Dec. 21), joining Kevin Ford of NASA, and cosmonauts Oleg Novitskiy and Evgeny Tarelkin to fill out the $100 billion science laboratory to its usual 6-person capacity. The spaceflyers also have some presents to look forward to. The Progress 48 cargo freighter — a robotic Russian supply ship that launched in early August of this year— carried more than just basic supplies to the ISS. The Progress also brought holiday presents for the spaceflyers who'd be spending Yuletide in space. As well as a traditional meal complete with turkey and candied yams, the crewmembers will also get the chance to video conference with their families. This is a particular treat because video chatting is usually possible only once a week, and involves a lot of planning for mission control and the spaceflyers. Despite NASA's best efforts to make the holidays in space as warm as they are on Earth, that doesn't mean astronauts won't get homesick. Marshburn, for example, has a 10-year-old daughter. "That'll be tough, thinking about her waking up in the morning, enjoying things," said Marshburn during a preflight interview with NASA, "but the fact is we've got some technology that'll allow me, hopefully through an internet or I guess an internet protocol session, to be able to join in with them and see their faces and they can see me. It'll be a little tough for me, as it would be for anybody, but I think the price is certainly well worth it, to be up there." Hadfield celebrated the holidays with his family before leaving for this, his second visit to the space station. Most of his family is spread around the world, Hadfield said during another preflight interview with NASA, so they celebrated the season early by flying to Kazakhstan to spend time with each other before his liftoff from the Baikonur Cosmodrome there. Hadfield is also an avid musician and guitar player, so music — and a guitar that lives on the station — will likely be a part of the Christmas celebration, Cloutier-Lamasters said. NASA astronaut Tom Marshburn does a flip in zero-g after arriving at the International Space Station Dec. 21. He, Russian cosmonaut Roman Romanenko, and Canadian astronaut Chris Hadfield had just docked aboard a Russian Soyuz spacecraft to join the existing Expedition 34 crewmembers, above. For his part, Romanenko said the prospect of a space Christmas is exciting. "I think it will be a big adventure, a big moment in our space life," Romanenko said in a NASA preflight interview. "And we'll be dressing up, we'll be decorating the station, we'll put up a Christmas tree, maybe we'll have some presents that will arrive on the cargo vehicles, which of course will make us very happy and will support us during this evening, this special time."